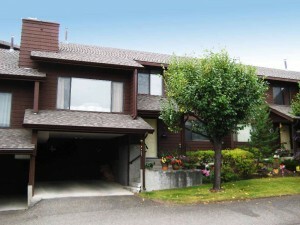 Bright townhome in a quiet area. This home features 3 bedrooms including a huge master bedroom and 2 full four piece bathrooms. The kitchen features lots of storage and a nice covered patio off the kitchen leading to a grassy area. The main floor has a split level design which results in very high ceilings, making this unit feel very spacious. There is a good sized rec room down with laundry and storage. The furnace has been updated and there is a newer heat pump (central a/c). Covered parking and one additional spot included. Pets allowed with restrictions (1 cat/1 dog- size restricted) and no rentals allowed. Call to view, day before notice appreciated.